This is fifth in a series on Emacs and org-mode. This blog post was generated from an org-mode source and is available as: a blog page, slides (PDF format), and a PDF document. org-mode isn't just an agenda-making program. It can also export to lots of formats: LaTeX, PDF, Beamer, iCalendar (agendas), HTML, Markdown, ODT, plain text, man pages, and more complicated formats such as a set of web pages. This isn't just some afterthought either; it's a core part of the system and integrates very well. One file can be source code, automatically-generated output, task list, documentation, and presentation, all at once. Some use org-mode as their preferred markup format, even for things like LaTeX documents. The org-mode manual has an extensive section on exporting. From any org-mode document, just hit C-c C-e. From there will come up a menu, letting you choose various export formats and options. These are generally single-key options so it's easy to set and execute. For instance, to export a document to a PDF, use C-c C-e l p or for HTML export, C-c C-e h h.
There are lots of settings available for all of these export options; see the manual. It is, in fact, quite possible to use LaTeX-format equations in both LaTeX and HTML modes, to insert arbitrary preambles and settings for different modes, etc. ELPA containts many addition exporters for org-mode as well. Check there for details. Automated generating of structural elements in the presentation (see, for example, the Marburg theme). This provides a visual reference for the audience of where they are in the presentation. org-mode's very easy and strong support for visualizing and changing the structure makes it very quick to reorganize your material. Combined with org-babel, live source code (with syntax highlighting) and results can be embedded. The syntax is often easier to work with. I have completely replaced my usage of LibreOffice/Powerpoint/GoogleDocs with org-mode and beamer. It is, in fact, rather frustrating when I have to use one of those tools, as they are nowhere near as strong as org-mode for visualizing a presentation structure. 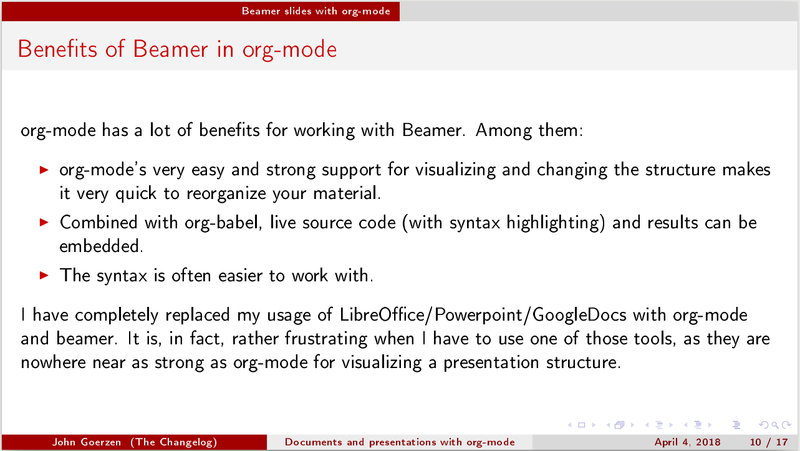 org-mode's Beamer export will convert sections of your document (defined by headings) into slides. The question, of course, is: which sections? This is governed by the H export setting (org-export-headline-levels). This gives a standalone section slide for each major topic, to highlight major transitions, and then takes the level 2 (two asterisks) headings to set the slide. Many Beamer themes expect a third level of indirection, so you would set H:3 for them. # We can't just +BEAMER_INNER_THEME: default because that picks the theme default. Here, aspectratio=169 sets a 16:9 aspect ratio, and the remaining are standard LaTeX/Beamer configuration bits. Sometimes you've got some really large code examples and you might prefer to just shrink the slide to fit. Just type C-c C-x p, set the BEAMER_opt property to shrink=15. (Or a larger value of shrink). The previous slide uses this here. With the org-tree-slide package, you can display your slideshow from right within Emacs. Just run M-x org-tree-slide-mode. 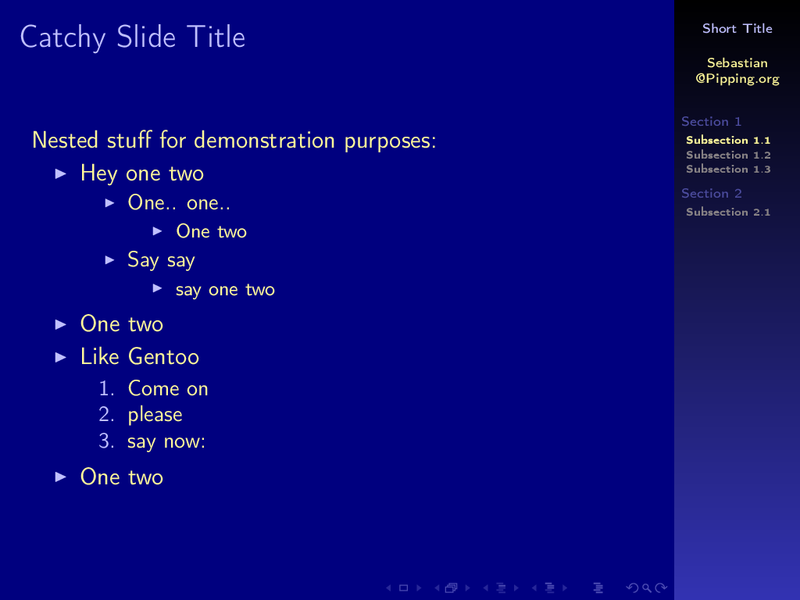 Then, use C-> and C-< to move between slides. You might find C-c C-x C-v (which is org-toggle-inline-images) helpful to cause the system to display embedded images. First, I wanted to let you know that I’ve found these org-mode posts helpful. I’ve been moving down the path of learning and using org-mode for a while now and I found some useful tidbits in your posts. Given something like the above, when you open the agenda, all four of those TODOs will be listed equally. In my world, however, what I think I would like to see for an agenda view is only the “leaf” items (the 2nd and 4th line above) as those are the items that need to be done now and the other items depend on these things being done. I’d like the agenda to reflect that. Even if the agenda showed all of the items, if it could show them in a hierarchical fashion would be good.